I have written before about my little fixation with Vogue Entertaining + Travel. Aside from combining two things which I love (food and travel), the food is always on supermodel mode. Yes, lovely to look at even if some of the recipes do not come out quite at the bombshell level. I don’t mind. I like looking at nice things. In any case, some recipes do deliver. This was one of those times. I spotted the Apple cider vinegar-glazed onion tart in the same issue as my Moroccan inspired meal (August/September 2005). It involved little baby onions, ricotta, thyme, and (as the name implies) apple cider vinegar, and it was absolutely exquisite. 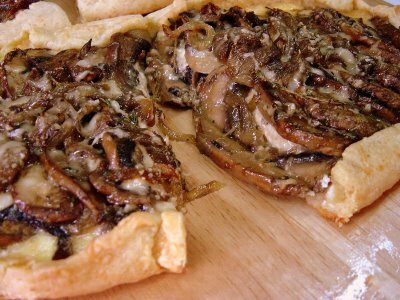 However, due to the laptop crash of October ’05, all pictures were lost, and the onion tart was just a sweet memory. – Make the pastry first. Combine the flour, salt, and cheese. – Add the butter in pieces and cut roughly with a pastry cutter. – Transfer the mixture into a bowl and knead (yey!) until it forms a ball. – Flatten the ball into a disc, cover with cling film, and refrigerate for at least an hour (or overnight). – Now for the filling. Heat the olive oil and butter in a pan over medium heat. – Add the onions and sautee until they are nice and soft. – Add the mushrooms and sautee for a couple of minutes. Add thyme and toss a bit until mushrooms are cooked through. – Now to assemble the tart. Preheat oven to 180C. – Mix the ricotta and the egg until well combined. Set aside. – Transfer the pastry to a baking tray lined with parchment paper. – Spread the ricotta mixture on the pastry, leaving a 5 mm border (more or less). 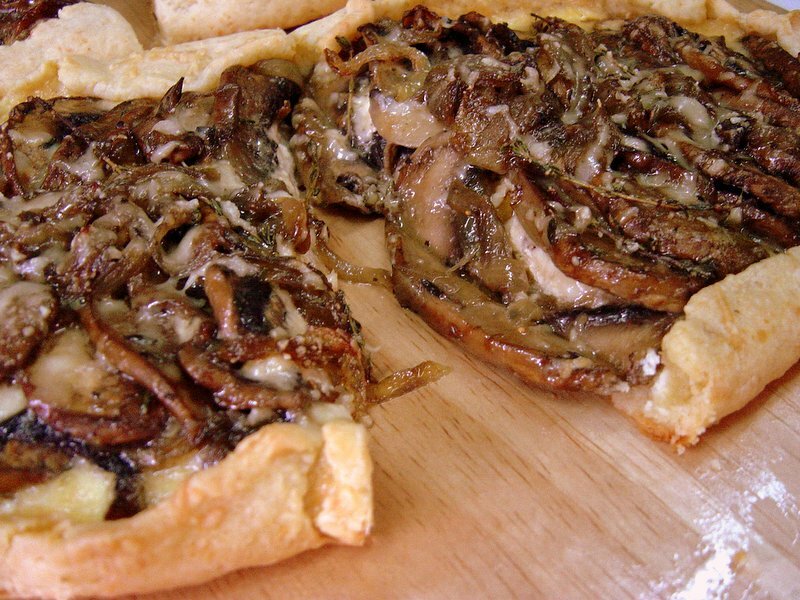 – Top with your mushroom mixture and fold over the border to sort of give your filling a little “hug”. – Bake for about 15 minutes or until the edges of your pastry are golden. This was delicious! It makes for a perfect light lunch (not the whole tart though!) with a simple salad. I used portobello mushrooms but you can substitute this with any mushroom you feel like having…or even a mix of different kinds. As I mentioned, I didn’t make enough filling for both tarts, thus the fig version…also yummy. This recipe has the potential to transform itself infinitely I think…savory, sweet, sweet/savory…any suggestions? « Lasang Pinoy 7: Gising na! ALMUSAL!